Can we talk about this palette?? So clearly it’s effing gorgeous and all the teaser swatches we saw prior to its release weren’t doing it justice. I like it a lot but there’s a few things I’m not crazy about. First the deets! You get 8 shadows for $49. Here’s issue number 1. They’re tiny, .02oz each. So less than half the size of the regular moondusts (.05oz). The palette is made of sturdy hard plastic and has a large mirror, similar to the packaging of their vice palettes. Issue number 2. The palette is entirely too big and bulky. The pans are way too spaced out. The palette could easily be half the size that is. But then you’d know how small the pans really are. Because less face it most consumers aren’t checking product amounts. I only do it for the sake of my reviews. Also I think they could’ve included a brush like they do with most of their more pricey palettes. 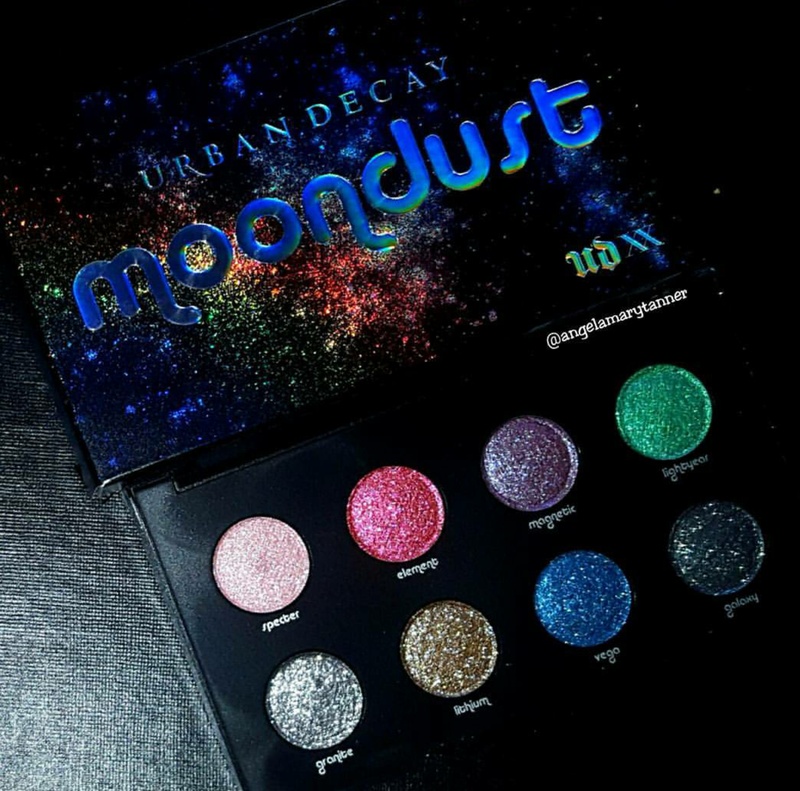 If you’ve never tried a moondust shadow before, they’re basically very glittery pressed pigments. The formula is extremely similar to the MAC DAZZLESHADOWS. Or even the MAC PRESSED PIGMENTS. They will adhere to the skin without a primer but you’ll want to use either a glitter adhesive or a facial mist if you don’t want fallout. The only colors I’m not crazy about are GRANITE and LITHIUM. 1. 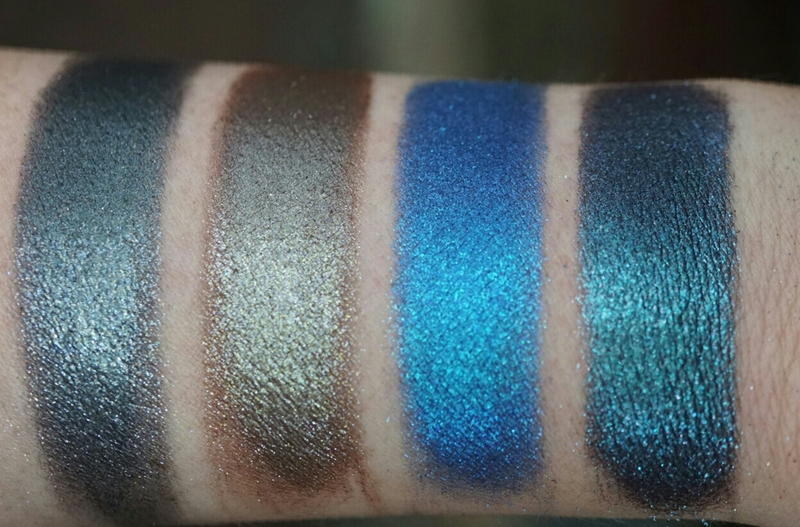 There’s 2 similar shades in the regular moondust line (ZODIAC and DIAMOND DOG, I think). 2. I don’t think they make sense in relation to the rest of the palette. Lots of fun bright colors and then a ‘meh’ brown and black. Plus I think we all have tons of glittery black and brown eyeshadows. Do we not? However I love the other 6 colors. 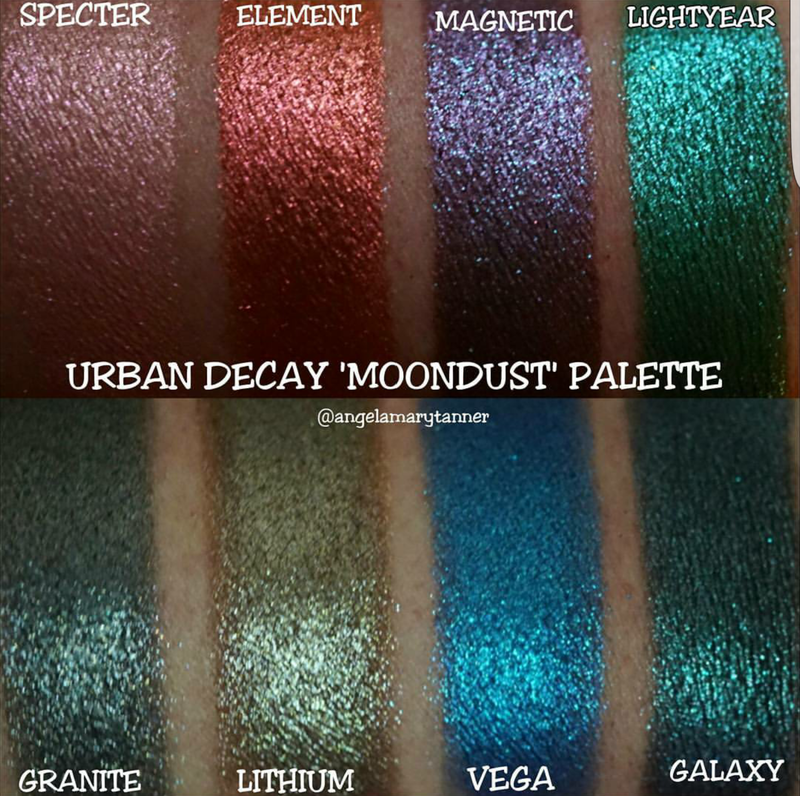 I’ve been working on finding dupes for my entire moondust collection so check out the ‘moondust’ category if you’d like to see more.